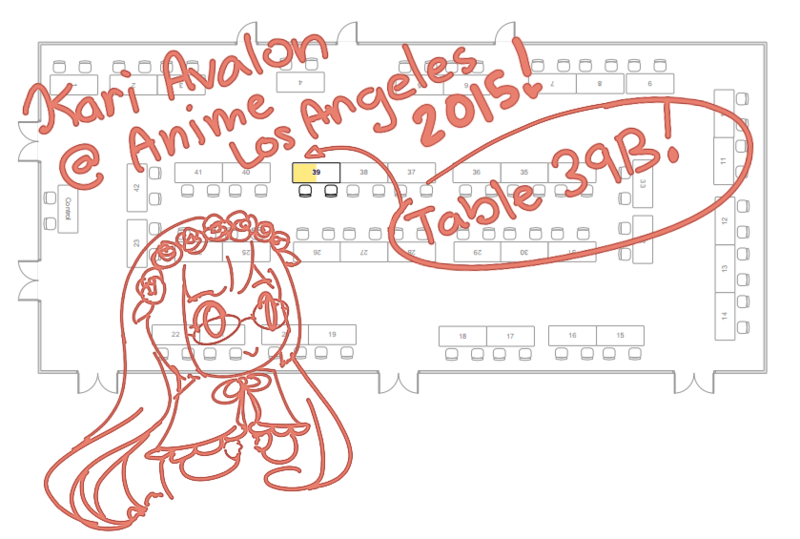 Anime Los Angeles (2015) was located at the Airport Marriott Hotel nearby the LAX airport from January 9-11, 2015. Artist Alley hours were from 12-8PM (Friday) and 10AM-6PM (Saturday and Sunday). Artist Alley was located in the Meridian room on the ground level. My space was at 39B and neighbored with [Peonies and Honey]! I heard about the convention through hearsay for several years, but the inconveniences involved typically involves me forgoing the convention. Moreso whenever I fail to gain, which I blame my lackluster internet speed, or win the lottery to participate into artist alley. Fortunately, I won a lottery spot! Admittedly, I was confused on whether I won or not because my name was misspelled to “Mari Avalon” instead of “Kari Avalon,” but the matter was resolved shortly after I e-mailed artist alley of my inquiry. Prior to the convention, I restocked on print bags and bought some bags that could reasonably be usable as poster print bags. Unfortunately, I forgot to purchase table cloth so I cannot make my table presentation as colorful as it could be. I also spared some time to create a shared larger mini print album alongside my medium-sized ones. I also upgraded the demo folder into a professional-quality portfolio. I actually kind of miss the semi-transparent pink portfolio, but the newer one is more durable than the previous one. As I only have half of a table to work with, I only took a partial amount of wire cubes with me. I also lightened my baggage materials again as my brother and I attempted to cram nearly everything into the same rolling bag I’ve used for all of the artist alleys I attended. I forwent my flower-print chipboard case and combined a few things together. I mulled over several methods in the most inexpensive and reasonable traveling time route… but public transportation still remains extremely flawed in So-Cal. Therefore, I commuted 95% of the way and took a nearby bus to the location. The first day had a more elaborate route, but the evening on that day ended less than ideally, but it didn’t dampen my excitement for ALA. The remaining days were a lot more swifter as I have since familiarized with the route. Table Assignment: As this was a established convention, I was already provided with details on my table’s location. Moreover, the badge pickup process was generally smooth. I was lost at first, but I was pointed to the correct direction easily. Set up: No blue painter’s tape this time! I actually spent a bit of time trying to remove the residue tape, though. It’s surprisingly resistant, haha. That aside, a good number of it remained because the prints would have covered it by then. I pondered on closing my table section with the remaining wire cubes, but that made me feel fairly claustrophobic so that idea was nixed. I settled with a floating partial hanging display. Much like my Touhou Con AA report, the content below was copied and pasted from previously drafted impressions. Only Day 3’s content wasn’t posted anywhere prior to this because I forgot to share it, haha. I got there safely and without trouble. I left early hoping none would happen especially with the stake of losing the table if I don’t arrive before 12PM. Unfortunately, trouble happened on the return trip… I don’t blame the venue per say, but it’s not a terribly convenient location in my opinion. So I’m welcome to the new venue next year (Ontario Convention Center) as it’s a lot closer to me! I didn’t cosplay. Will wear wig + flower crown tomorrow on Day 2. Arrived at 10+AM and got into the AA by 10:35AM. Trash bin is a shared one via sections. Setup took a while due to figuring out how to display the wire cubes. Business was slow in general, but the typical amount for a small con on the first day. I’ll chalk it up to the day being a school day for a number of attendees. Drew a few lineart and sketches. Sketches aren’t too good, but the inked ones turned out fairly nice. One was original and one of chibi Anise from TotA. Madoka Magica charms were pretty popular. I’m very close to selling them out~ yay! I’ve been meaning to get rid of them business-wise for 2+ years. (ಥ____ಥ) Please sell out. I thought moving mini prints and sharing its display with the medium prints album would be more convenient. Will observe to see if the move is more effective. Stayed at my table most of the time. Took a few breaks, though. Lunch/Dinner was In-N-Out. Courtesy of my brother. Thanks! Ribbons are a thing at ALA. I have a official artist title, and one for PMMM Rebellion. Got there early after a morning delivery. Parked at Aviation Station and rode bus #6. On arrival, I went to don my Phyrgia wig + flower crown hairband at the restroom while my brother helps set up. Upon return, we determined that we should put more of my posters up because compared to other cons, I found that ALA attendees were less inclined to look at the poster album. Perhaps looking at products at face value is preferred (and perhaps valued)? First thing I sold was my last Marchen charm set! By then, I only had four crab-claw straps leftover. I discounted the final price accordingly because I felt bad that the buyer won’t have enough straps to include to the charms she wants to give to her friends. Moreover, it was neat seeing a Laurant!! EDIT: I technically have another set leftover [gahh unintentional mis-advertisement; sorry about that! But, this remaining set is incomplete for it’s missing Marchen and doll Elise]!! Speaking of charms.. about 98% (invented value) of the remaining madoka magica charms sold. I only have 2 Kyokos left by then, and I had run out of straps so I’m selling them as-is. Randomly hanging a few mini-prints up on display led to increased visibility and therefore, more sales. Likewise for putting P5 protagonist on the front page of the mini-prints side album. I may have to consider reprinting it because it appears that Persona 5 is getting more visibility. I worked on a new line art, and worked on a few commissions (one of them being a super cute Yang and Blake (of RWBY) which I’ll consider showing later). Encountered SunnyJones (dA) and she just gave me the fluffiest and incredibly warm personally-crafted pale pink (one of my favored colors in certain clothing articles, haha) muffler! *A* I’ll definitely include it in my rotation of scarves~~ thank you!! She, who is a regular staffer at AX, moreover clarified that Anime Expo’s artist alley 2015 policy on new applicants’ portfolio submissions is not as heavy-handed as having a judgment on the submissions. Instead of the exaggerated judgment over submissions, the updated application process only asks for a portfolio website. The website could even be just a deviantART gallery, or any other online gallery portfolio that could be included. There is no judgment involved whatsoever. Thank you so much for clarifying that caveat to me, Sunny! I’m pretty sure there are a few people who read my reports so I would like to relay this updated piece of information. I will likewise modify my previous AX report to reflect the actual practice. I got involved in “their” simple plan of saying “Happy Goth Day” to a specified couple once they visit my table to receive their RWBY poster. Their, I am predisposed to assume is their “manager,” casually negotiated with me (with a copious amount of tip that left me surprised and gaping somewhat because woww) to follow on the plan. It didn’t exactly go as fully scripted, but I made sure to gleefully say the above phrase to the couple. ^^ Their cosplay group was amazing too! Touhou Con’s representative passed by my table and had me promoted through their social networks (ie: twitter, instragram). I typically censor my face so I had a business card to censor my eyes LOL. During the few breaks I was graced with (lunch and late afternoon), I tried finding the con suite and was rewarded with snacks. ALA has this service set up to keep hunger at bay, but it’s not a meal substitute (.. which I used it as such, haha). Not trying to understand the con layout, I got lost for a while trying to find certain rooms. I eventually gave up haha. I think the fervor for ribbons (ALA social tradition) increased exponentially today. I gained another ribbon from a kuroshitsuji cosplayer (circus!Dagger, I believe) and a Log Horizon one from my brother (acquiesced to give me it because I kept on admiring it and his ribbon chain’s gotten kind of long). Oh! The hotel also provides beverages, though hot ones run out quickly not long after the room opens to attendees. Yesterday on Day 1, I had Chamomile tea and today I had Green Tea Jasmine tea. I found the Meridian Room (AA) grow hotter as usual (as in, this was how yesterday went too) when there’s a increased amount of browsing attendees. I almost regret wearing my black hooded sweater.. but I refused to take it off lol. As far as I could see, only a trickle amount of attendees actually go to Artist Alley. I found that most prefer hanging out and going to other con activities than to try to meander through the pretty stifling warmth that permeates AA. I don’t blame them in that respect since there’s a lot to do there and moreso if you have friends to socialize and have fun with. I panicked when I thought we missed the return bus as brother thought the TAP cards were rendered useless and therefore void, but I would have paid for the return trip. We ended up taking a bus that’s faster than the one we missed. Yay! I should add that rain was more frequent on the highway. Made it back to the area in time, or with time to spare. I prefer that than to be very tardy (a poor case scenario). Overall, I broke even, and possibly begun profiting, which is a huge plus! I typically reinvest my earnings towards future artist alley events, though. I look forward to tomorrow now that I’m comfortable with my situation, and that AA closes earlier so that I would not have to feel anxious about driving in a cool and possibly frosty night. Travel time overall was pleasant, and perhaps the nicest of all of the days I went to ALA. It helped that Day 3 ended earlier, haha. Moreover, the weather was more pleasant and even the end of the day had some sunlight breaking through the clouds. Like the previous days, I arrived there on time and set-up went smoothly. I was glad that everything was intact since I left earlier on Day 2 due to prior commitments. Day 3 brought in several rounds of chibi commissions, but I had to close them early due to the sheer amount received. I’m sorry to those who were genuinely waiting for me to reopen them! I gave him mini prints of the characters he and his sister cosplayed loool (Persona 5 protagonist and Matin Catorce from The Epic of Zektbach). I believe I took a longer break after my commission and lunch round, which would answer why I figured accepting anymore commissions after my return wouldn’t be a good idea, haha. For lunch, I had In-N-Out again, lol. The food was bought after I asked my assistant brother to reprint some of my prints at a local Office Depot. Received a few ribbons from a few cosplaying attendees! Thank you!! More attendees took advantage of my bulk deals. Yay! Thank you! [Peonies and Honey] departed before closing (I hope you had a good time at ALA!) so I moved my medium and mini-print album over to 39A. 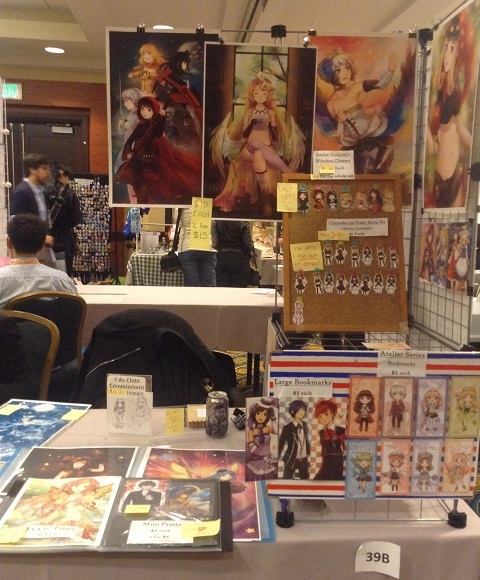 My immediate table neighbor [blurbiart] also shared the space.. in the most amusing way possible. Her helper wanted to get rid of the leftover fruit and drinks badly so she stacked the mandarin oranges and apples and had the drinks hold up a clear file-like poster of.. I forgot his name, but he’s from fate//ZERO. Needless to say, the attempt was hilarious and wildly successful (in moving fruit and drinks, no idea about business). Kira Buckland passed by my table!! I also barely recalled her name until she introduced herself. ;A; I’m so sorry! She was also a guest for ALA. It’s pretty neat seeing guests wandering and enjoying themselves at smaller cons. I stayed till closing time as artist alley run was shorter on Day 3. My trades and gifts from ALA~ thank you all so much! Apart from a poor evening after Day 1’s activities (which is not ALA’s fault I should add, but it was notable in leaving me shaken for a time, aha), I generally had a great time! I had no idea what to expect since I have never attended ALA personally due to the location being farther than I am comfortable with. I have heard of rumors (mainly that ALA is a social and party convention should one stay at the venue’s hotel), but I still couldn’t fully gauge what to expect. Needless to say, I’m pleased with the outcome! I met up with some friends, met with incredibly generous people, and awesome neighboring artists. Business exceeded my expectations and I generally had a lot of fun at ALA 2015. I’m going to try to get into ALA’s 2016 artist alley, but I’ll have to wait and see how they’ll set up registration. I sincerely hope that it will be more expansive now that they have secured a presumably larger venue.